“The Lakes is a unique Australian golf course. It is one of very few where natural water hazards are a part of the play and at the opening hole and the three back nine par fives water is the dominant hazard. It is both thrilling to negotiate and a nagging concern. 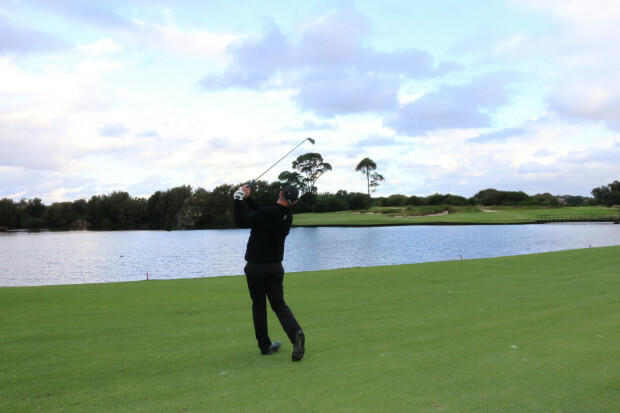 It was more than a concern when in his own 1998 Greg Norman Classic the great man splashed three long irons into the lake fronting the 14th green on his way to a twelve. The course is split by the airport to city freeway and seven of the front nine holes play on the ‘other side’ of the road. The rolling dunes so characteristic of this part of Sydney make for some really interesting golf and great power is of little advantage unless its use is well considered.